A little piece of history about Crieff, a town that is ideally located for visitors wanting to discover Scotland.Crieff in Perthshire has for centuries been a wonderful place to visit and explore as it comfortably nestles into the highlands in the hub of Scotland. Its people are welcoming and the landscape has a wonderful array of varied scenic views throughout the Highlands and Lowlands alike. Visitors can feel the true sense of freedom as they stroll the county’s cities and enjoy endless walks in the countryside. The ability to relax and the warm welcome given to visitors is boundless. 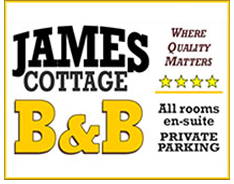 The town caters for all local requirements within walking distance of James Cottage. Once an ancient cattle market and Scottish ‘frontier town’ where Highlanders would come for the great cattle trysts. Built in the early 19th century, James Cottage was used regularly by the buying Lowlanders while buying cattle to transport across the border to England.Currently a family-run 4-Star B&B, James Cottage in Burrell Street allows visitors the freedom to discover the fascinating history of Perthshire as they stroll down the town’s High Street where once the likes of Rob Roy MacGregor, Bonnie Prince Charlie, Robert Burns and Robert the Bruce once walked. The Lynch family at James Cottage add to the relaxed atmosphere with their newly furbished luxury en suite bedrooms that feature quality doubled glazing throughout. Whether you are looking for an active holiday or just want to enjoy the mountainous scenery, lochs, dozens of golf courses, river or sea fishing and a host of other activities, you can be assured of a warm and personal welcome at The Cottage.Crieff is the main town of Strathearn lying on the southern edge of the Scottish Highlands. 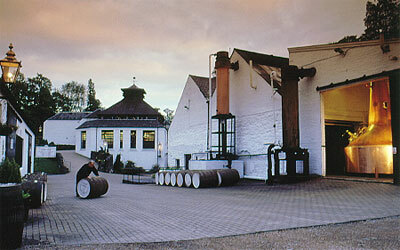 It has been a holiday resort since Victorian times and is the second largest town in Perthshire with a population of almost 7,000. It spills from the Knock – the wooded hill above – down to the River Earn. 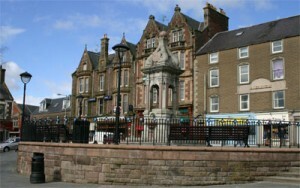 James Square with its purpose-built fountain marks the centre of the town. 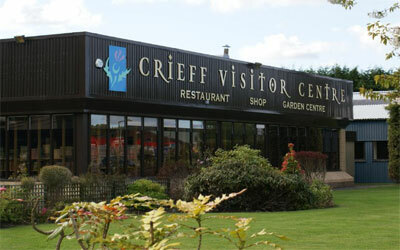 There are a number of tourist attractions such as Crieff Visitor Centre, Waterford & Stuart Crystal Centre, Drummond Castle, Glenturret Distillery (Scotland’s oldest and also home to The Famous Grouse whisky), several championship golf courses such as Gleneagles which is located only seven miles from Crieff, and boundless rivers and lochs on which to enjoy angling.Crieff is the ideal location from which to discover Scotland as it is less than an hour’s drive to both Glasgow and Edinburgh while traveling north, the visitor is enjoying the delights of the Highlands within minutes of leaving the town centre. Macrosty Park was opened in 1902. It is named after its benefactor, James Macrosty who became Provost of the town. 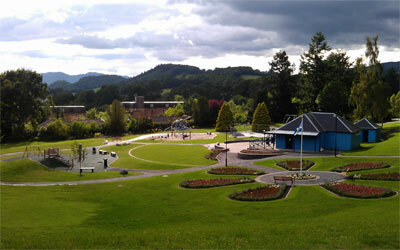 The park is one of the most picturesque in Scotland with a selection of mature specimen trees and the Turret Burn flowing through it.The Victorian bandstand, gifted by the brother of James Macrosty, has brass band concerts in Summer. There are a variety of activities and two children’s play areas. A number of picnic tables are placed around the park, making it an ideal place for a day out in fine summer weather. Lady Mary’s Walk was gifted to the town in 1815 by Sir Patrick Murray of Ochtertyre. 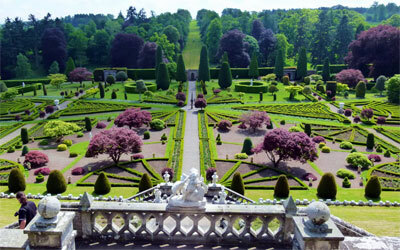 The walk was a favourite of his daughter, Lady Mary. A beautiful beech lined avenue runs alongside the River Earn for about 1500m. There is considerable variety of trees, plants and wildlife to observe on this fine walk.Traditional MacGregor lands lay along west Perthshire and across to Loch Awe. By supporting Robert the Bruce, Campbells were given huge tracts of land in Argyll and Perthshire which had previously been MacGregor. MacGregors were forced to live in the poorest remoter areas of what became Campbell land. There was never really peace between the Campbells and MacGregors. During the 16th century the Campbells even tried to establish a ‘tame’ line of MacGregor chiefs under their control!James VI was married in 1598. A Royal Forester, John Drummond, was to provide venison for the feast. While hunting he was set upon and killed by MacDonalds from Glencoe. They later arrived at the Stewarts of Ardvorlich beside Loch Earn on their way home demanding refreshments. To her horror the lady of the house saw the head of her dead brother John and never recovered from the shock. Further on their journey, they met with MacGregors of Balquhidder who sided with and swore to support the MacDonalds; MacGregors had been hanged by Drummond for poaching. This act and other ‘offenses’ around the beginning of the 17th century resulted in more than a hundred years of slaughter and persecution of the MacGregor clan. MacGregors fought in support of Montrose in his rebellion for Charles I. In gratitude Charles II later repealed the proscription on the surname MacGregor.However, with the demise of the Stuart monarchs it was re-proscribed when William IV became king. Robert ‘Roy’ MacGregor (1671-1734) was given the nickname ‘Ruadh’ / ‘Roy’ because of his wild red hair. 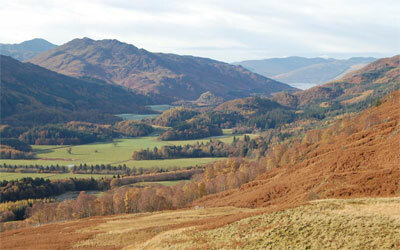 At 18 he took part in the battle of Killiecrankie where Jacobites, under the command of Viscount Dundee, opposed the replacement of their Stuart King with William of Orange.Rob Roy visited the town of Crieff on many occasions, often to sell cattle, and it is believed he stayed at James Cottage as a guest of the landowner. In the second week of October 1714 the Highlanders gathered in Crieff for the annual market. Civil war was expected at any time. By day Crieff was also full of soldiers and government spies! Just after midnight, Rob Roy and his men marched to Crieff Town Square and rang the Town bell. In front of the gathering crowd sang Jacobite songs and drank several loyal toasts to their uncrowned King James VIII. Rob Roy usually used the surname Campbell. His wife was a Campbell and he enjoyed, to some extent, the protection of that Clan. In 1715 he initially fought on the Jacobite side and his MacGregors raided the lands around Loch Lomond. However his benefactor the Duke of Argyll had chosen the Government side and Rob Roy with mixed allegiances was forced to miss the Battle of Sheriffmuir. Even so he became a marked man and was hunted for almost 10 years escaping capture on several occasions. James Cottage has named one of its bedrooms Rob Roy Macgregor in his honour.